All The Extra Table Settings You Need! 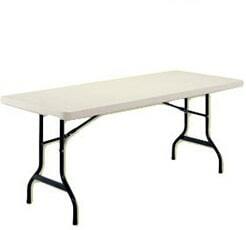 Our 6ft rectangular tables are perfect for accommodating your guests! Sturdy, yet light enough to move around easily, the perfect addition to your event! Need smaller tables for the kiddos? Check out our Kids Tables!